1918: Gartland. Built in 1892 by Redheads of South Shields for Whimster & Co. Garland was a defensively armed steamer of 2,613grt and 91m long. She was torpedoed and sunk without warning by the German submarine UB30 about 5 miles east of the Owers light vessel off Kelsey Bill. She was carrying coal from the Tyne to Gibraltar. 2 crew were lost. 1918: Birchwood. Built in 1910 by Ropers for Birchwood Shipping, she was carrying coal from Glasgow to Devonport when she was attacked without warning and sunk by German submarine U61, 25 miles east of the Blackwater light vessel. 1943: Pinewood. Built in 1930 for France, Fenwick, she was 2,466grt. She struck a mine some 1.5 miles off Southend Pier and sank. Six of the crew were lost. 1943: British Vigilance. Built in 1942 by Harland & Wolff, Govan, she was 463 feet long, 8,093grt. On 3rd January 1943 she was in Convoy TM-1 from Curacao to Gibraltar carrying petrol when she was attacked by German submarine U514 about 900 miles north-east of Barbados. Abandoned by the crew, she burnt and drifted until she was finally torpedoed and sunk by U105 on 24th January 1943. 25 crew and 2 gunners lost. 1944: Empire Housman. Built in 1943 by William Oxford in Sunderland, she was a 7,359grt cargo ship. 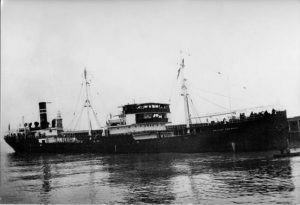 In Convoy ON217, she was torpedoed and damaged on 31st December 1943 by German submarine U545, she was attacked again on 3rd January 1944 by U744, and finally sank on 5th January 1944.